Great turnout tonight, with about fourteen people on the mats. Unlike the previous couple of lessons, apart from Dónal and I that was almost entirely complete beginners, aside from a blue and a visiting purple. Many of them were from the taekwondo class that takes place in the hall downstairs: always cool to see people willing to cross-train. It makes me wonder what it would be like to give striking a go again, as my previous martial art had a lot of influence from taekwondo. I'm curious if I can still get my kicks up high, or if all these years later my tendons would complain too much. We're continuing with the theme of side control all this month. 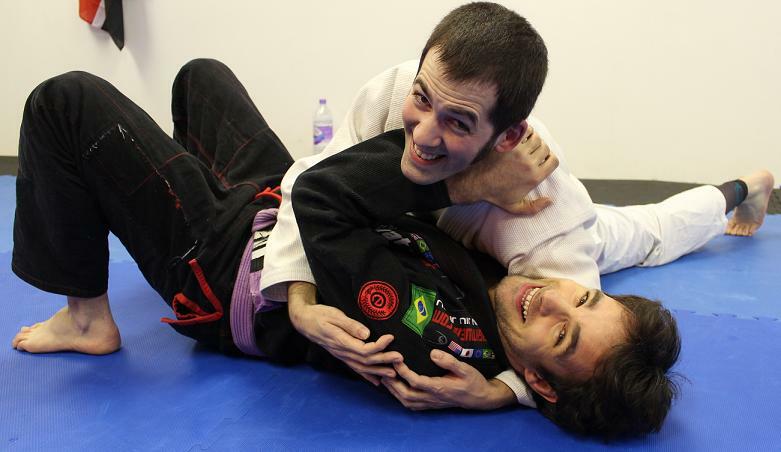 Dónal decided to teach another class on maintaining side control, drawing on some of his previous lessons. If they turn away while you still have a standard grip (i.e., arm under the head and the other other by their far arm, like I'm doing in the pic at the top of this post), you can slide right into a seat belt grip. This was a simplified version of what Dónal showed last week, as he didn't then continue into the back take, sticking with just jamming your grip tightly into their chest. Similarly, the option for when they turn towards you was stripped down as well. Dónal went through the first part, when they're trying to get their knee through to start recovering guard. Grab around their back, then backstep so your hips are pointing towards their legs. This also neatly moves you around their knee, blocking them from recovering their position. The focus tonight was on helping people get used to that turn. I was mainly drilling with the two children who were there today, resulting in a useful exercise in breaking down the technique to its simplest version. So, I talked about stamping your foot on the ground, then using that to lift and turn your other leg. It would be cool to launch a kids class in future, though that will depend on how it goes in terms of numbers.